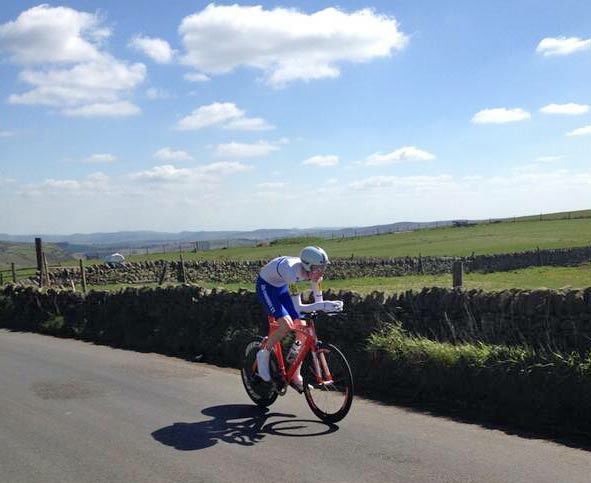 The Buxton Mountain time trial is one of the hilliest time trials on the calendar. About 1,100m of climbing over 33 miles (22 miles for vets and women). 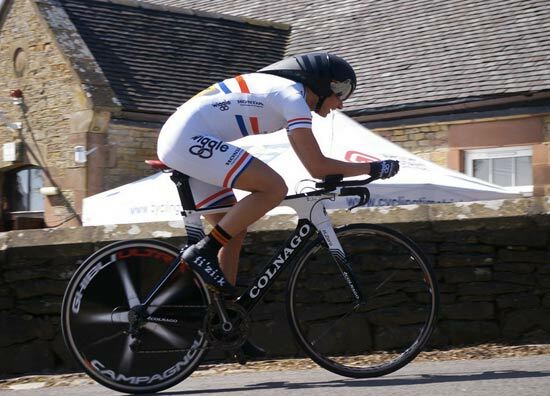 This year, it was part of the CTT national time trial series, and it attracted a bumper entry with 144 riders signing up for the race. The course record was set by Stuart Dangerfield in August 2003 with a 1:22:13. The women’s event attracted some top riders, including double world champion Joanna Rowsell. Rowsell is a track specialist and a member of the world record setting British team who clocked 4.16 for the team 4km pursuit. That’s just shy of a mind boggling 35mph (and a pretty good standard for a men’s team). But, compared to the team pursuit, the Buxton MTT is a very different kettle of fish, with average speeds of roughly half of 35 mph. In the men’s event, Matt Clinton (Mike Vaughan Cycles) won in a time of 1.23.23. (23.74mph) Pettinger (Sri Chinmoy CT) (me) was just 2 seconds behind in 1.23.25, and Espoir C.Fennel (PMR @ Toachim House) was third with 1.24.56. 1st paracylist Rik Waddon (Para T. Paracycling Team). Honourable mention also to 1st under 16 – Adam Hartley Velocity WD-40 1.02.01. 1st Vet J.Ramsbottom (Pedal Pushers) 00:56:58, with Peter Greenwooed (Team Swift) fastest vet on target. I had a good block of training in March and early April, and went well in the Circuit of the Dales. But, during the last week I did very little apart from a few easy miles around Kissena Velodrome in NY. I got back from NY yesterday morning, and just about managed to make myself get on rollers for 30 mins in a perfunctory attempt at a pre-race warm up. With the inevitable jet lag, I was grateful for late start of 2pm and (as last year’s winner) I started as last man off at 180. At least when racing, I felt no effects of jet lag – helped by the good weather. Conditions were near perfect for April. Sunny, light wind and relatively warm. I set off reasonably quick on the first lap, passing through time keeper in about 27.00 (319 watts average). After the first lap, it was a bit harder to maintain that pace, and the average speed very slowly declined. The third time up Axe Edge was particularly hard going. It’s a tough course with quite a few sharp corners and changes of gradient. I tried to increase the effort near the top of climbs so I could recover on the next downhill. It’s impossible to do a measured effort because the gradient is so variable. Where possible it’s good to try and maintain momentum from downhill onto the next incline. Though, this year, I felt a little rusty on the corners. I did hear time checks that I was up on Clinton on the first two laps. But, in the end, I finished just 2 seconds behind. 2 seconds is a little ironic as that was the exact winning margin in the National Hill Climb Championship 2013. As the old saying goes – You win some, you lose some. Cycling can all be about fine margins, though it’s rare for a 33 mile hilly TT to be decided by such a small margin. The problem with just missing out by 2 seconds, is that you can’t help but think where those 2 seconds may have come from. Like all good cyclists, it’s very easy to analyse after a race, where it wasn’t perfect. So many excuses spring to mind – equipment, training, traffic, cornering – even the good old fashioned ‘Why didn’t you just pedal a little harder!’ – I wish I could have pedalled faster on the final hill, but I was pretty spent. – There’s a bylaw in Cycling Time Trials that at the finish you’re supposed to shout you’re number to help the time keeper. As no. 180, I thought this was my chance to shout out ‘Oneee Hundered and eighteeeeeeee’ in the manner of all good darts commentators. It might have been mildly amusing, but after the last effort to the finish line, I think the only ‘180’ I managed to say was heard by nobody including myself. I must admit shouting out of your number is one of those bylaws I rarely manage. I think being a hill climber must exempt you on many occasions. After the race, I was eyeing up Matt Clinton’s new Trek TT bike. All being well, I’m planning to buy one myself this year. At least losing out by 2 seconds gives a bigger incentive to splash out the money in the hope that £5,000 may make at least 1 or 2 seconds difference…. Anyway, in the end I decided to blame those 2 seconds on all those New York corn muffins and high fructose corn syrup I ate in the past 2 weeks. New York is the only place in the world, where even I can put on weight. I always ‘enjoy’ the Buxton MTT, especially when the weather is as kind as this year. It was a good atmosphere with so many riders and it was well organised by Buxton CC. The organiser Richard looked as if he had made as much effort as the riders at the end. A good job well done. It’s a funny feeling to do a reasonably good ride but just miss out. I’m in good form after a good few weeks of solid training in March. I was just 15 seconds slower than last year. Though flying off to New York and pottering around on a road bike definitely takes a bit of momentum from the time trialling. But, Matt Clinton’s in good form so it’s no bad thing to finish just behind him. Next year the Buxton MTT is in March, so we can expect more normal weather conditions, such as rain or snow drifts. I’ll be back. Thanks also to the sponsors for helping make a generous prize list. I cannot believe that your traveling and diet changes did not have a bearing on your time, it must do, but there’s not much you can do about it except change your plans. Hell of a time though and very well done, but I notice you are already riding a Trek TT bike, so what difference will the latest model offer in terms of performance. my model is 2010. The 2014 model promises more speed. Great ride coming off the back of jet lag and all that food. I have been there and know what you mean about putting on the pounds. It seems like one meal there could feed the 5000. Have you any more rides up north ? I got these two photos. Matt did look very comfortable on his new bike. and for a bit of fun I did a lap on Sunday, the uphill bit went, but not good going back down to Longnor. the uphill bit went well I meant to say. Great peformance Tejvan, quite clearly the TT bike and aero kit gave you a 23 minute advantage on me and my road bike!! 🙂 Great event though, I’ll be back next year too.